Donegal's Karen Guthrie scores a goal from long range against Dublin. ©INPHO/Tommy Grealy. 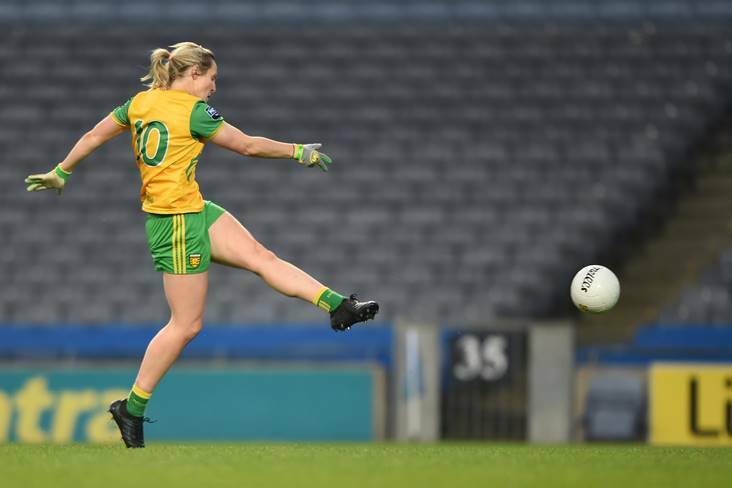 Captain Karen Guthrie led the way again as Donegal battled through a deluge in Convoy to seal their second win on the trot when pulling away from a gallant Mayo outfit in the final quarter. The heavy rain made handling difficult but both sides produced some excellent passages of play before the home side closed powerfully to seal the deal. The opening half, played in heavy rain, was see-saw in nature with both teams enjoying periods of dominance and eventually ending up where they began – level – at the interval. Donegal began like a train with their forwards running riot. Their cause was helped by the fact Mayo were operating with 14 players after their captain Niamh Kelly was sin-binned in the second minute. The home side drove forward and raced into a six-point lead thanks mainly to the excellence of Karen Guthrie who kicked 1-3 in the first 12 minutes. That left Donegal sitting pretty but when Kelly arrived back onto the pitch, Mayo cut loose. The impressive Fiona Doherty and Rachel Kearns landed points before Kelly slalomed through for a goal. That revival left Mayo two clear as the interval neared but a brace of frees from Guthrie just before the break left it all square – 1-6 apiece. The third quarter was a real battle of attrition with scores very scarce but Natasha Gaughan did nudge Mayo back in front after 41 minutes. However, that was as good as it got for the Connacht women and a 43rd minute goal from Ciara Grant changed the momentum and another one from Roisin Friel gave the home side the breathing space to enjoy a 3-8 to 1-7 lead after 50 minutes, but Mayo weren’t finished. Fine play from Danielle Caldwell and Sinead Cafferky got them moving forward and Kearns rattled home a goal to give them some hope. However, Donegal were in no mood to be caught and the excellent Niamh Hegarty closed out the game with two fine points and Donegal had sealed their second win in as many games while Mayo will learn a lot from their trip to Convoy. Scorers – Donegal: K Guthrie 1-5 (3f), R Friel 1-1, N Hegarty 0-3 (1f), C Grant 1-0, A Boyle Carr 0-1. Subs: A McColgan for Nee (16), R Friel for McGroddy (43), T Hegarty for Grant (59). Subs: R Durkin for G Kelly (h-t), A Sheridan for Moran (h-t), N Gaughan for Needham (37), A Halligan for Durkin (52), L McManamom for Clodagh McManamon (56), A Roddy for Finn (57), T Hall for Flynn (57), S Wilson for Sullivan (59).